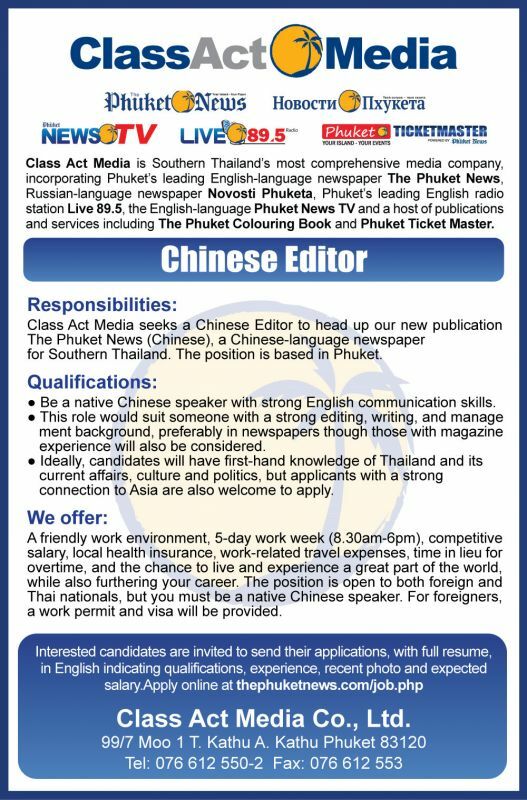 Class Act Media seeks a Chinese Editor to head up our new publication The Phuket News (Chinese), a Chinese-language newspaper for Southern Thailand. The position is based in Phuket. -Be a native Chinese speaker with also strong communication skills in English. -This role would suit someone with a strong editing, writing, and management background, preferably in newspapers though those with magazine experience will also be considered. -Ideally, candidates will have first-hand knowledge of Thailand and its current affairs, culture and politics, but applicants with a strong connection to Asia are also welcome to apply. - A friendly work environment, 5-day work week (8.30am-6pm), competitive salary, local health insurance, work-related travel expenses, time in lieu for overtime, and the chance to live and experience a great part of the world, while also furthering your career. The position is open to both foreign and Thai nationals, but you must be a native Chinese speaker. For foreigners, a work permit and visa will be provided. Interested candidates are invited to send their applications, with full resume, in English indicating qualifications, experience, recent photo and expected salary.